We can not forget the huge contribution to the conservation of the history of the whaling industry by Tim and Pauline Carr, and The Government of South Georgia and the South Sandwich Islands. We start at King Edward Point and Grytviken. All arrivals in South Georgia must undergo Customs and immigration checks here. Passport stamps are also available. There was a small garrison at King Edward Point, now gone, and the only people who are permanent residents on the Island are the staff who run and maintain the Whaling Museum in Grytviken. 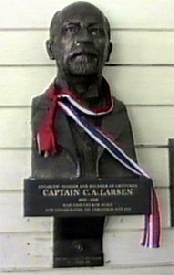 The oldest of the whaling stations, Grytviken was founded in November 1904 by Captain Carl Anton Larsen. (pictured left) The old Manager's house at Grytviken was refurbished and now houses the museum. The whaling stations had their own power generating plant, but Grytviken also boasted water driven turbines fed from the lake above, as well as diesel driven sets. 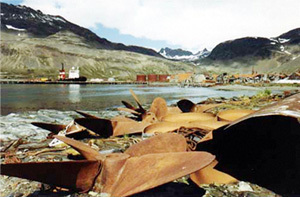 Grytviken officially closed in December 1964. 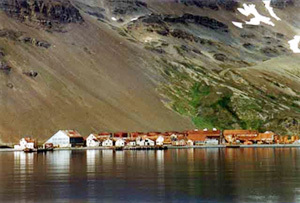 The largest of the whaling stations is Leith Harbour. Leith Harbour operated as a shore station from it's inception in 1909 till it closed in 1965. Factory ships also operated in Leith Harbour. Leith is a huge complex with generating stations, boiler plants and even a large well appointed hospital. We used to maintain the mooring at Leith Harbour, but a few years ago it was lifted and brought back to the Falkland Islands. Stromness Harbour is a large repair yard and not a whaling station like the others. It had originally been an operational whaling station. Set up in 1907 as a floating factory site, the shore station being built in 1912. Stromness operated as a whaling station from 1912 to 1931 when conversion was undertaken. The visual clue being that there is no flensing plan which all the shore stations had. There are vast workshops, machine shops and a foundry. At the time the men boasted that they could virtually build a ship in it's entirety. There were vast amounts of spares kept at Stromness and it is sad to see boxes containing (what was at the time) new radar sets etc. which have been smashed and vandalized. All operations ceased at Stromness Harbour after the 1960 / 1961 season. 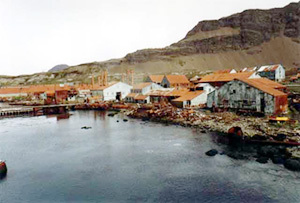 Initially Husvik was a floating factory site, a shore station being set up in 1910 with a break in operations from 1930 to 1945. It was partially dismantled in 1960 - 1961 and the freezer plant was moved to Grytviken. In one of the storage sheds at Grytviken the Husvik boxes for the frozen whale meat were housed, but never used. Godthul 1908 to 1929. A station for factory ships, Godthul only had a rudimentary base ashore. Jason Harbour 1909 to 1926. Jason Harbour was never used as a whaling station, it's permitted whale catchers operated out of Grytviken. Ocean Harbour 1909 to 1920. A shore station at what was previously known as New Fortune Bay, Ocean Harbour was almost completely dismantled and moved to Stromness. Rosita Harbour 1909 to 1923. Previously known as Allardyce Harbour, no whaling operations were conducted here. It's permitted whale catchers operated out of Leith Harbour.